I Love Adventure is a continuation of the I Love a Mystery concept, with the same characters played by different actors. 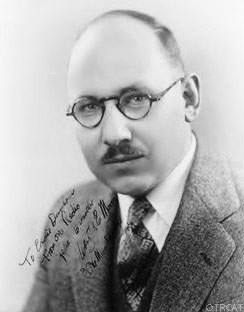 Writer/producer Carlton E. Morse wanted to rekindle the spirit of freewheeling adventure that the three pals created, and so reworked the characters, although using only two of the three together at a time. Jack Packard is the constant hero, strong and quick witted, around whom the plots thicken. He's played by Michael Raffetto. Reggie York (Tom Collins) is in the first eight shows, and then leaves the series without a great deal of fanfare. Doc comes in to take his place until the end of the thirteen shows. Morse gives us the continuing saga of Jack, Reggie and Doc as having closed their A-1 Detective Agency and gone their separate ways due to WWII. Jack Packard, the superior brain of the trio, naturally got into intelligence work, Reggie joined the RAF, and Doc also saw winged service with the Flying Tigers. A shadowy secret group with an Illuminati-like aura called the "21 Old Men of 10 Gramercy Park" bring the first pair, Packard and York, together to work on cases such as the kidnapping of a very elite girl's school and fight Nazi renegades or international gang terrorists. These stories, as written by Morse, have the ring of contemporary events - probably due to the depth and powerful moral view of good vs. evil that underlies much of Morse's writing. In the middle of the series, Jack and Reggie leave England and get back to Hollywood, USA. It's a good change of pace, but then Reggie is gone, and Doc Long (Barton Yarborough) takes over for the rest of the shows. In some, such as " Girl in the Street," the boys are just bookends for a story that involve mystery and mayhem. Some say they love the original I Love a Mystery too much to make the leap. Most think these half-hour stories don't do justice to the rich and varied dialogue of I Love a Mystery. Both points are well taken, but I Love a Mystery is still an excellent show with good acting and production values, and Carlton E. Morse always delivers excellent radio adventure. Also on the mystery and adventure list would be Adventures by Morse, Voyage of the Scarlet Queen, Suspense, Bold Venture, David Harding, Counter Spy, Cloak and Dagger, Frank Race, the classic serial I Love a Mystery, Jungle Jim, Moon Over Africa, and You Are There. The recognized greatest of the high-adventure old time radio shows is Escape, which told classic tales of mystery and adventure in near-perfect manner. Be the first to comment on "I Love Adventure"